Each of our mouse pads are proudly made in the USA at our Scottsboro, Alabama facilities with sharp, colorful graphics. Our Mouse Pads measure 9" in width by 7 3/4" in height and are 1/4" thick. 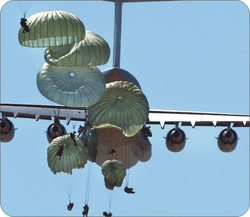 This 82nd Airborne Paratrooper mouse pad features Paratroopers from the 82nd Airborne Division jumping from a C17 Globemaster at Ft. Bragg, N.C., during Exercise Joint Forcible Entry. Photo taken April 11, 2005 by Scott F. Reed and is courtesy of the U.S. Army.